Author: Nothomb, Amelie Set In . . . The Japanese believe that until the age of three, children, whether Japanese or not, are gods, each one an okosama, or "lord child." On their third birthday they fall from grace and join the rest of the human race. 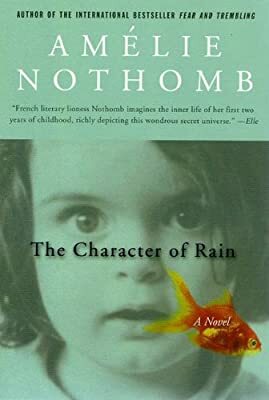 In Amelie Nothomb's new novel, The Character of Rain, we learn that divinity is a difficult thing from which to recover, particularly if, like the child in this story, you have spent the first tow and a half years of life in a nearly vegetative state. "I remember everything that happened to me after the age of two and one-half," the narrator tells us. She means this literally. Once jolted out of her plant-like , tube-like trance (to the ecstatic relief of her concerned parents), the child bursts into existence, absorbing everything that Japan, where her father works as a diplomat, has to offer. Life is an unfolding pageant of delight and danger, a ceaseless exploration of pleasure and the limits of power. Most wondrous of all is the discovery of water: oceans, seas, pools, puddles, streams, ponds, and, perhaps most of all, rain-one meaning of the Japanese character for her name. Hers is an amphibious life. The Character of Rain evokes the hilarity, terror, and sanctity of childhood. As she did in the award-winning, international bestesller Fear and Trembling, Nothomb grounds the novel in the outlines of her experiences in Japan, but the self-portrait that emerges from these pages is hauntingly universal. Amelie Nothomb's novels are unforgettable immersion experiences, leaving you both holding your breath with admiration, your lungs aching, and longing for more.